These venomous lizards need large enclosures with plenty of elbow room. 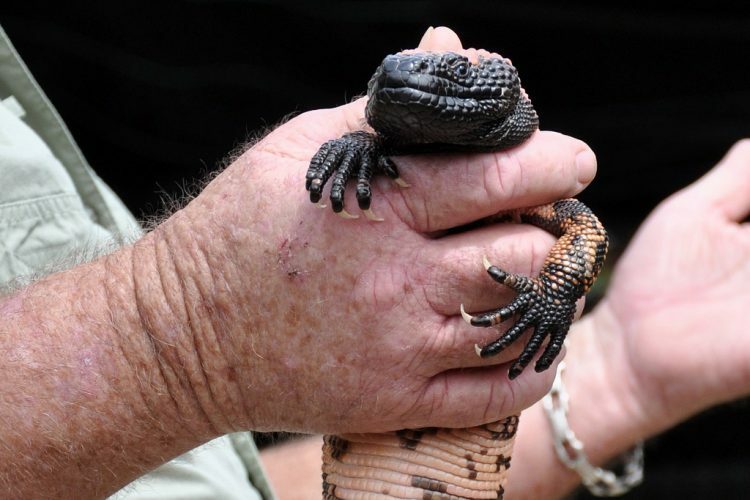 Read this expert Pet Gila Monster Care Guide from Petful. Gila monsters are venomous lizards who are often bred in captivity in the United States and kept as pets. Be warned — this is not an “easy” pet doesn’t require much care. Rather, this lizard needs constant vigilance to ensure that their needs are met. Laws regulate where Gilas can be kept, and the penalties can be stiff for circumventing them. With that in mind, if your state allows Gilas to be kept as pets, read on. If not, perhaps a gerbil is a better pet for you. Gila monsters — Heloderma suspectum — are native to the deserts of the southwestern United States and northwestern Mexico. Gilas are the largest lizards native to the United States, reaching lengths of 2 feet and weighing in at over 5 pounds. They acquired their name from the first place they were spotted, Arizona’s Gila River basin, in 1869. These lizards are strikingly beautiful, with black bodies that have pink, yellow and orange patterns traced on their skin. In traditional lizard style, they have forked tongues. Their bodies are stout and their legs are wide, with curved claws tipping the feet. These cold-blooded lizards spend a great deal of time underground when in the wild, usually surfacing during the morning or on particularly warm evenings. They eat only a few times a year. Their diet consists of eggs (reptile and bird), birds, insects and smaller mammals. Gilas have a keen sense of smell and can dig up eggs hidden as deep as 6 inches. Research the laws in your state to ensure that you are allowed to keep a Gila. For example, in many states, you may only keep a Gila monster who has been bred in captivity. Capturing one in the wild is strictly prohibited. And in some states, it’s illegal to own a Gila monster. States such as Arizona and Utah actively watch their Gila populations and are not afraid to charge poachers. 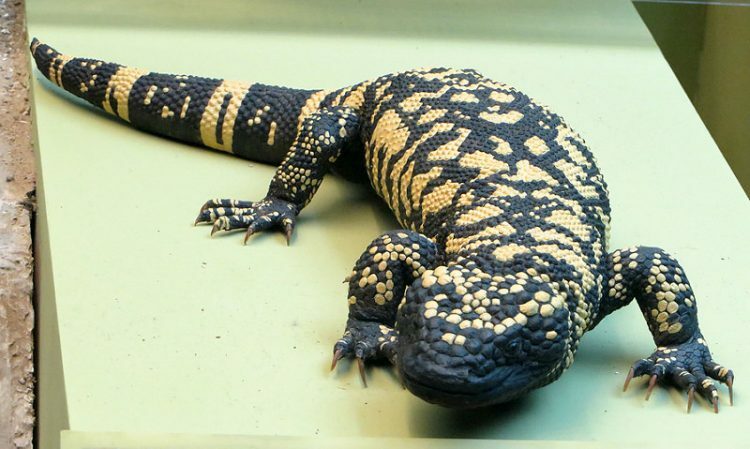 In Massachusetts, it’s illegal to own a Gila monster, period. Do your homework, or else you might be out your pet and a hefty chunk of change in fines. The Gila likes underground burrows and rocky crevasses in the wild, so you’ll want to try and replicate that as best you can. Your Gila will also need plenty of “elbow room” to be happy. “Gila monsters are rather large animals, and need large enclosures,” says Petra Spiess on Kingsnake.com. When you buy your enclosure, be sure it has a cover, not only for your Gila’s safety but for others’ as well. Remember, these lizards are venomous and are wild animals who won’t take kindly to being poked and prodded by others. The enclosure should be at minimum spot-cleaned daily, with a weekly disinfection of the cage and all items within, so be sure you have the appropriate cleaning materials on hand. Do not use phenol-based cleaners, which can be toxic to pets — stick with chlorine or alcohol based cleaners. All items should be rinsed thoroughly so that any cleansers are fully removed before replacing items into the enclosure. Substrate should be deep enough to absorb moisture — but not so deep that you can’t find feces or uneaten food. Remove soiled substrate immediately. The goal is to keep the enclosure as dry as possible. Periodically, you should discard all substrate and replace it with fresh material. Animalworld.com recommends replacing the substrate every 1–2 months. 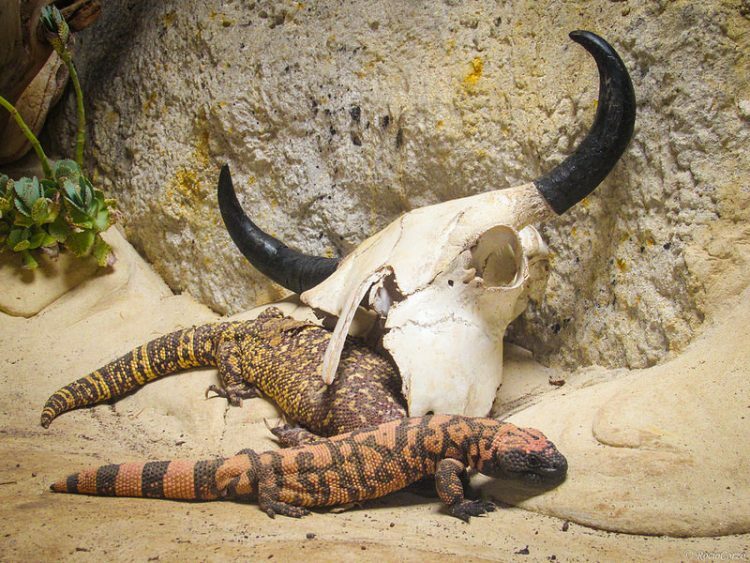 Next in this Gila Monster Care Guide, we discuss the items that go inside the enclosure, as well as feeding and care of the Gila. Gilas enjoy basking in water, so provide a heavy dish for them to do so. Change the water often and make sure your Gila can safely climb in and out. These lizards spend much of their time in their dens and burrows, so providing a similar space for a captive Gila is a great idea. Use a plastic container large enough to comfortably fit your Gila. Cut a hole at one end. Place moist peat or sphagnum moss inside, and let your Gila enjoy. Gilas are cold-blooded and use external sources to regulate their body temperature. In the wild, they do this by exposing themselves to sun and shade accordingly. You need to provide those heated and cool areas for your captive Gila. “The temperature needs to be between 85–90 [Fahrenheit] (29–32 [Celsius]) degrees under [a] basking light…. The cool end of the cage needs to be in the low 70s…. A basking area can be as simple as an elevated rock and placed under the basking light,” say Rearick and Brough. Temperature is critical to your Gila’s well-being, so have a backup plan in case of power outages. Gila monsters are used to having a set period of light and darkness. With this in mind, give your Gila a basking light, which you can find at many retailers. Always wear heavy gloves when handling your Gila. No matter how tame they are, if they’re startled, they may bite. Never hold your Gila by the head or tail — this can cause injury. Also, never allow inexperienced people or especially children to handle this pet. 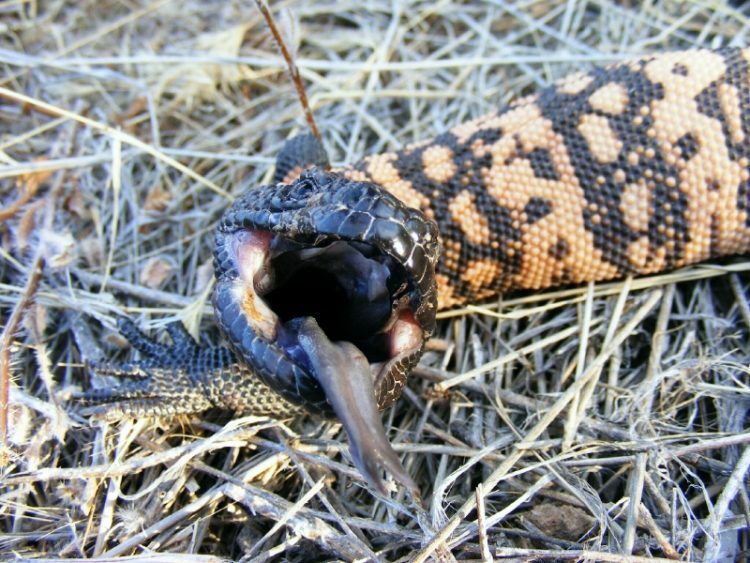 Human fatalities recorded due to Gila bites are exceedingly rare, but this doesn’t mean a bite is nothing to worry about. Gila monsters literally use their teeth to deliver their venom. Unlike spiders, who inject venom, Gilas shunt their venom from modified salivary glands in the lower jaw to the teeth themselves. They get the venom into you by chewing. If you are bitten, don’t pull the Gila off the ground — this could cause more damage. Gilas have a tenacious bite. You may need to submerge yours in water to get them to stop. Once you are free, seek medical attention immediately to counteract the venom. Gila monsters’ diet in the wild consists of eggs, mammals, insects and even carrion. “In the wild, their food supply for an entire year would be consumed in 3 to 4 months. Adult males and nonbreeding females can be fed about every 2 weeks,” say Rearick and Brough. Feed your Gila mice and rats, such as you would get for a snake. Eggs should be given sparingly — they may make your Gila obese. So if you want more than 1 Gila, give them plenty of room in the enclosure and watch them carefully. They will scuffle over food and breeding rights. If you’re interested in getting a Gila, follow your local, state and federal laws. Work with an experienced Gila handler to learn the ropes before taking on a Gila of your own. You’ll be more confident, and your Gila will thank you for it – in their own way.